We had 2.2 inches of rain in the rain gauge on Monday. It all soaked in too, so we desperately needed the moisture, even after all the snow this winter. That’s hard for me to imagine. But over the weekend, several brush fires broke out, so the rain was very welcome. Despite all the rain, and an abnormally warm day Saturday, we are well behind schedule in the bloom department! So on this Earth Day, here’s what’s blooming in or near my yard. This is the flower of a plant grown mostly for its foliage, petasites japonica. I grow the variegated variety. 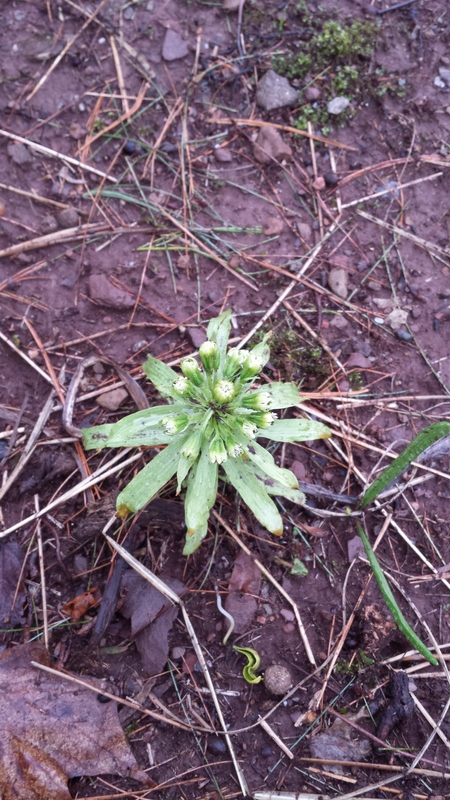 Some find it to be a nuisance because it is a groundcover, or a spreader. This is in one of the drier spots in my yard, so it is not a nuisance for me. 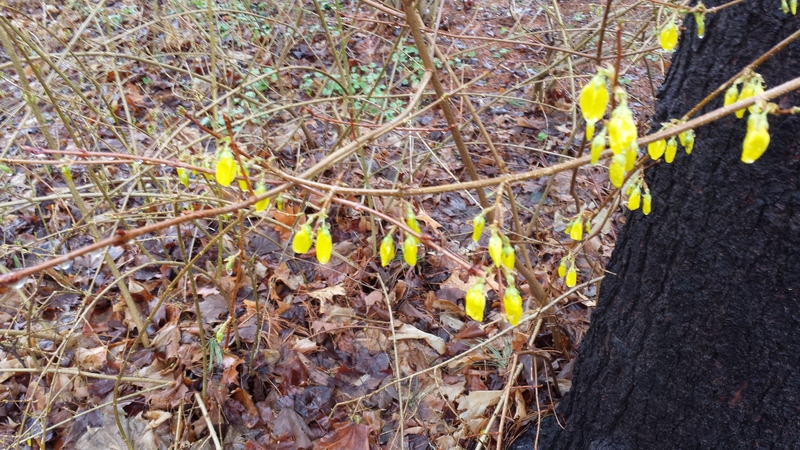 I have seen more robust blooms on forsythia in December some years! It just can’t seem to open this year in my neighborhood. It is blooming in warmer parts of town. That’s the effect of a microclimate. We live near a small lake. It stays warmer into the fall, but we are slower to warm up in the spring because of the water. This is one of the Spoiler’s favorite shrubs to butcher with the electric hedge trimmer. 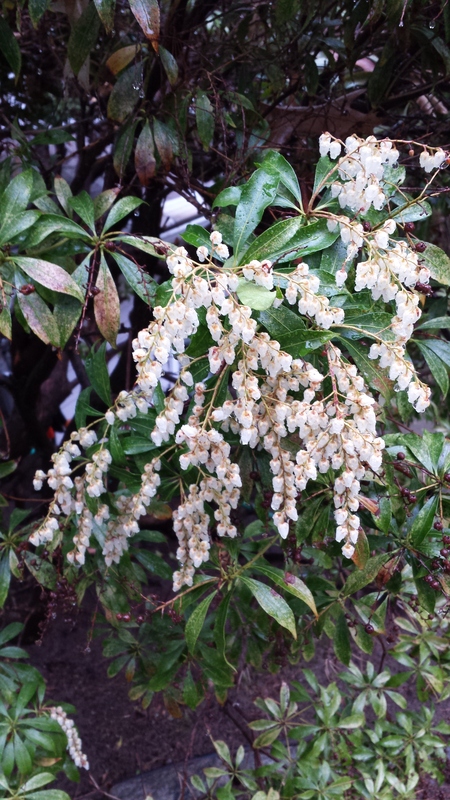 It is pieris japonica, known in the trade as Japanese andromeda. It usually blooms about a month earlier than this. It is a favorite of the native bumble bees, even though it is obviously not a native plant. 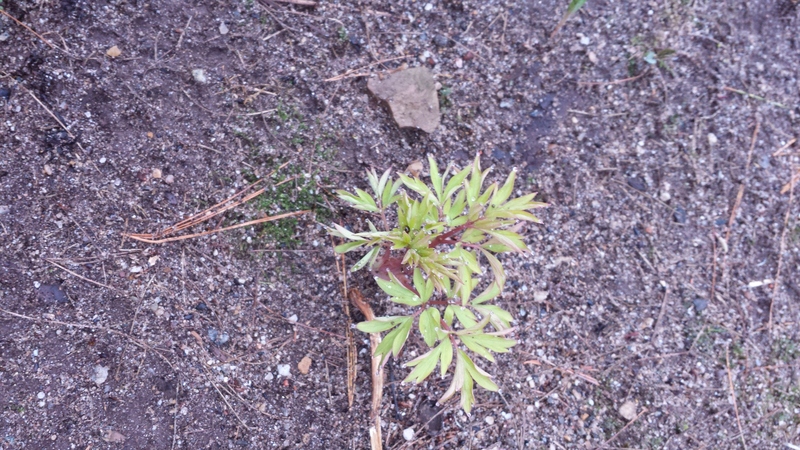 This is an unusual form of the perennial bleeding heart, dicentra spectabilis. Its foliage is golden. It’s quite striking next to the hot pink drooping “hearts.” The cultivar name is ‘Gold Heart,’ appropriately enough. 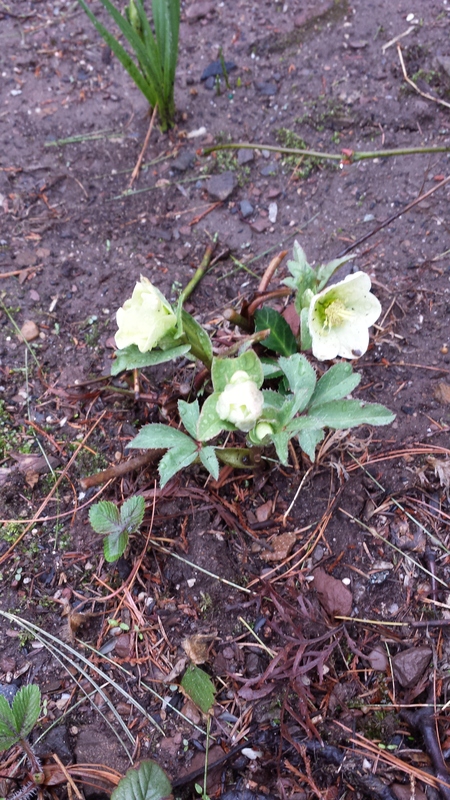 Finally my little rain-battered hellebores are just starting to bloom. Don’t ask me variety–I never pay much attention to that sort of thing although I do have it somewhere. At least they are blooming–last year I had nothing but rangy leaves. Good thing the Spoiler doesn’t really pay much attention to this garden! They would have been compost for sure! Next Article Take This Test–How Earth Kind Are You?